In Jersey City the Teacher Union Is Bargaining On Both Sides of the Table. Last Night One Ethical Board Member Tried to Uphold District Integrity. I was a school board member for twelve years, including nine years as president. I thought I’d seen it all, including fraught negotiations with unions. I remember one particular negotiating session that commenced at 5 pm and concluded (successfully!) at 3:30 am the following morning. I ran home, got the house in order, packed lunches, got my kids ready for school, and was back in the Central Office by 8 am to sign a Memorandum of Understanding. But I didn’t realize how easy we had it until I started following the board shenanigans in Jersey City, New Jersey’s second largest school district, which educates 30,000 students, mostly poor and of color. 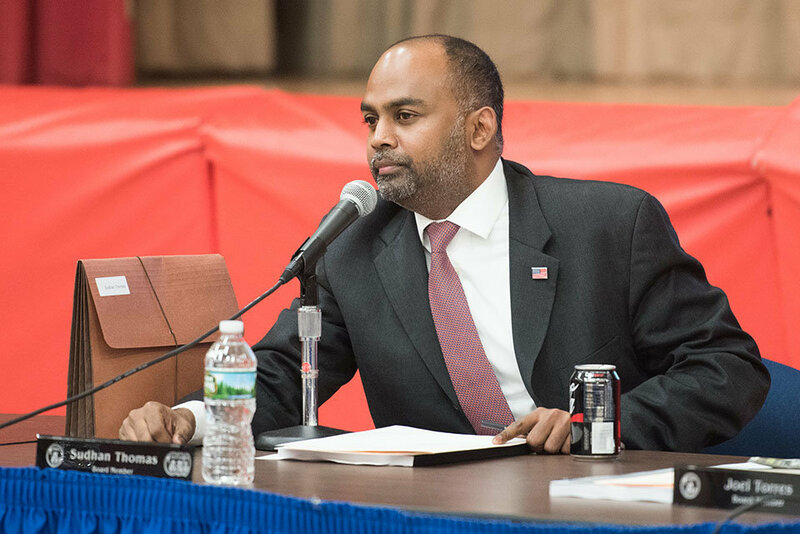 Last night Matt Schapiro announced at the Jersey City school board public meeting that Thomas has met nine times — accompanied by one other board member, Lorenzo Richardson — with the JCEA negotiating team. Mr. Thomas is negotiating with the teachers’ union without informing the board and without board authority. I will recognize that authority rests with the board of education and will make no personal promises nor take any private action that may compromise the board. I will confine my board action to policy making, planning, and appraisal, and I will help to frame policies and plans only after the board has consulted those who will be affected by them. Has Thomas violated these assurances? Let’s look at his alleged private actions, his determination to go way beyond policy-making, and his surrender of independent judgement to special interest groups. What’s so bad about the board president meeting with JCEA without the authority of the board to hammer out a contract resolution? To answer this question, one must know how union negotiating works: the Board president appoints a committee of typically three board members and they work with the superintendent and the business administrator to produce a proposal (really a wish list) of changes they wish to make to the current contract and this proposal is reviewed by the full board. Most critically, the board as a whole directs the negotiating team on how high a raise they can offer, what concessions they’re prepared to make, and what their priorities are. After each negotiation session, which is conducted between the board team and the union team with administrators on hand for advisement, the chair of the negotiating committee updates the full board on progress or lack thereof in achieving resolution. The board is on one side of the table. The union is on the other — literally. That’s a lot of money for a board seat. 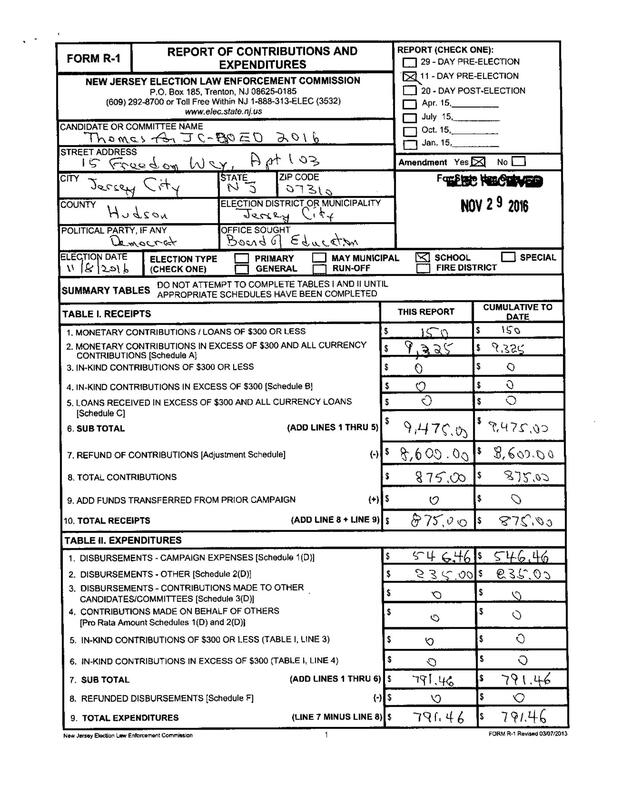 Thomas paid himself $1,000. He paid a company called “Glocal,” which he claims to be CEO and President of, $4,500. 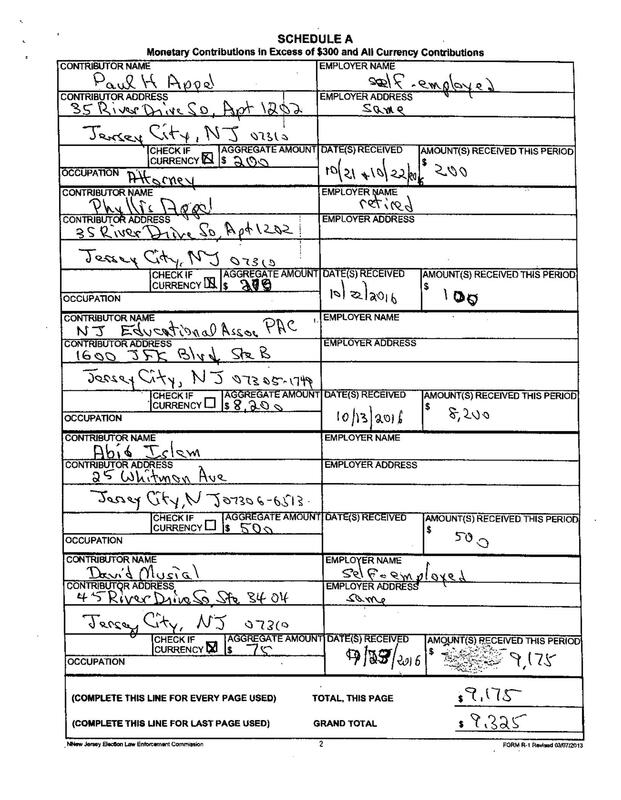 His personal attorney Paul Appel got $3,100. A google search for “Glocal” + “Sudhan Thomas” yielded zero hits. I’ve never heard of a aspiring board member giving him or herself a stipend for campaigning. But I don’t live in Jersey City. Jersey City Public Schools regained local control this past October. As part of the process of regaining control, the DOE appointed Cathy Coyle as a monitor but then removed her. No one replaced her (which may have more to do with the DOE than Jersey City’s poor governance). With Lyles on administrative leave (at a salary of $231,000 per year) the assistant superintendent and the curriculum supervisor are running the district. Except they’re working without a contract because the board refused to renew them. The board also refused to renew the contracts of eight essential employees last summer despite the fact that Lyles recommended them for renewal. Of the eight, seven are people of color. Six have sued the district for $5 million each. Previous PostThere’s a New Report Out From NACSA on ‘Reinvigorating the Pipeline’ for Charter Schools. Too Bad Jersey Is Out of the Running. Next PostKIPP Camden Students Rock a Hackathon with A Jewish Day School!